India Post GDS Result 2019 Date! Hello, friends have you applied for the Post Office Recruitment recently released to fill up more than 20000 Gram Dak Sevak (ग्रामीण डाक सेवक) Vacancies?? Now, are you looking to check latest news on Post Office Gramin Dak Sevak Result 2019 Cutoff Marks and Merit List of your Postal Circle?? Don’t worry here are all the latest information on this web page. As per recent update, soon the Indian Postal Circle Result for GDS Vacancies along with cutoffs is going to release online state wise. Whenever GDS Results ready to release by the Department of Posts (DoP), it will publish at the official website only. More than Lakhs of candidates have applied for GDS Vacancy and waiting for release of Post Office Results to know their status for document verification. All those who want to download DOP GDS Merit List 2019 Circle wise can click on the direct link available below. After downloading the selection list, just find out your Name and Registration Number available in it or not. 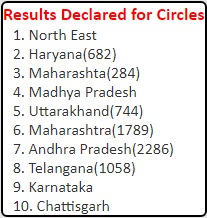 We have updated complete details about India Post Gramin Dak Sevak Bharti Results for 23 postal circles here. Candidates can refer it from the following passages. « LATEST NEWS on Gramin Dak Sevak Post Office Results » Update-1) DOP results of North East Gramin Dak Sevak 748 Vacancies has released on 08th March 2019. Hurry up, check your result from the link available below in a table showing state-wise merit list. In recent time, the Indian Postal Department had released latest Employment News for 10th pass candidates to recruit them for massive job openings. The recruitment notification published for total 25000 GDS Jobs in 23 Circles, i.e. Andhra Pradesh Postal Circle Recruitment (190 + 2286 vacancies), Haryana Postal Circle (682 vacancies), Maharashtra Postal Circle Recruitment (1789 + 284 vacancies), Punjab Postal Circle (620 vacancies), Madhya Pradesh Postal Circle Recruitment (2411 vacancies), Delhi Postal Circle (16 vacancies), Assam Postal Circle Recruitment (467 vacancies), Himachal Postal Circle (391 vacancies), Gujarat Postal Circle Recruitment (1912 vacancies), Rajasthan Postal Circle Recruitment (1577 vacancies), Telangana Postal Circle Recruitment (127 + 1058 vacancies), Odisha Postal Circle Recruitment (1072 + 93 vacancies), CG Postal Circle Recruitment (2492 vacancies), Jharkhand Postal Circle Recruitment (256 + 1236 vacancies), Karnataka Postal Circle Recruitment (1048 vacancies), Tamilnadu Postal Circle Recruitment (123 vacancies), WB Postal Circle Recruitment (5778 vacancies), Uttarakhand Postal Circle Recruitment (744 vacancies), Bihar Postal Circle Recruitment (1471 vacancies), Uttar Pradesh Postal Circle Recruitment (5314 vacancies), Kerala Postal Circle Recruitment (1193 vacancies), and North Eastern Postal Circle. The authority invited eligible contestants for their selection to the posts under all the circles. In response to these notifications, enormous candidates have come forward and applied their applications at the official website. Dear, Friends! As we know, you all are tired of waiting for your results ever since the registration process over. We can see your eager and anxiousness about knowing the latest details on India Post Office Gramin Dak Sevak Result of your State. As of now, we are not having any update or information reading Merit List. We will do our level best to serve you latest updates here whenever available. Our team will keep trying to grab any useful information if they get from the DoP authorities. We can understand your anxiety but keep patience as all these Sarkari Results will release before March or April 2019. However, Hope for the BEST. ⇒ As of now, the India Post has declared GDS Results for Haryana Postal Circle (682 vacancies) on 23rd Feb’19, Maharashtra Postal Circle (284 vacancies) on 27th Jan’19, Madhya Pradesh Postal Circle (2411 vacancies) on 06th Dec’18, Uttarakhand Postal Circle (744 vacancies) on 23rd Aug’18, Maharashtra Postal Circle (1789 vacancies) on 06th Aug’18, Andhra Pradesh Postal Circle (2286 vacancies) on 21st July’18, Telangana Postal Circle (1058 vacancies) on 25th May’18, Karnataka Postal Circle (1048 vacancies) on 07th April’18, Chhattisgarh Postal Circle (2492 vacancies) on 06th April’18, Bihar Postal Circle (1471 Vacancies) on 04th April’18, Jharkhand Postal Circle (1236 Vacancies) on 04th April’18, Kerala Postal Circle (1193 vacancies) on 26th March’18, Andhra Pradesh Postal Circle (190 vacancies) on 28th Feb’18, Odisha Postal Circle (93 vacancies) on 13th Feb’18, Telangana (TS) Postal Circle (127 vacancies) on 14th Feb’18, Punjab Postal Circle (620 vacancies) on 08th Feb’18, Haryana Postal Circle (438 vacancies) on 04th Feb’18, Gujarat Postal Circle (1912 vacancies) on 05th Jan’18, Tamil Nadu Postal Circle (128 Vacancies) on 22nd Dec’17, Himachal Pradesh Postal Circle (391 Vacancies) on 21st Dec’17, Jharkhand Postal Circle (256 vacancies) on 12th Dec’17, Assam Postal Circle (467 vacancies) on 07th Dec’17 & Delhi Postal Circle (16 vacancies) on 24th Nov’17. Candidates who have applied for these DOP jobs can visit the official website and check their results. The Indian Postal Merit List of Gramin Dak Sevak (GDS) vacancy for All State Post Offices and Circles will be available here soon after published by the DOP officials. One thing every candidate need to keep in their mind that whenever they download the merit list, the details like Reference No., Registration No., Birth Date, etc. will be required. All those who don’t know how to download merit list from the official website can follow the steps given below. Those Names of the applicants available in the Merit List means they have cracked the job and then they will get a call for the document verification. Every applicant must note that the official site of DoP is best viewed in Google Chrome, Internet Explorer 9.0 and above at 1024 x 768 resolution. India Post Gramin Dak Sevak Cutoff Marks will be available here shortly as soon as decided and release by the DOP. Cut off Marks will be Category-wise. Due to the heavy competition, the cutoff marks might be higher. As far as our knowledge concert, the authority will fix cut off marks based on a total number of candidates applied for Gramin Dak Sevak Jobs during the submission dates. Through the cutoff score, the final merit/ selection list will be made by the organization. The Postal Dept will call qualified candidates for verification of original documents on scheduled dates one by one. All those applicants finding information for the release date of Indian Post Office GDS Merit List can keep viewing this website to get latest updates in upcoming days. We are expecting that results might be revealed in June last week. DOP (ग्रामीण डाक सेवक रिजल्ट) results will be made available only at the online portal. Contestants will receive notification through SMS about their result declaration date. If your name or registration number appears in the merit list, then you will be called to attend further process.To find out your all answers, just check out Frequently Asked Questions (FAQs) from the following table. Answer As of now only the result of North East (NE) State, Odisha State, Andhra Pradesh (AP) State, Telangana (TS) State, Delhi, Assam State, Himachal Pradesh (HP), Jharkhand State, Tamilnadu (TN) State, Gujarat State, Haryana State, Punjab State, Kerala State, Bihar State, Chhattisgarh (CG) State, Karnataka State, Maharashtra State, Uttarakhand (UK) State and Madhya Pradesh (MP) State has published while other states’ results are in-process of release so don’t worry.